1. Working on a generous working surface, place the flour in a mound in the center of the board. Sprinkle the salt across the top of the mound. 2. 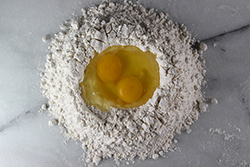 Make a 4-inch well in the middle of the flour, crack two eggs into the well. 3. 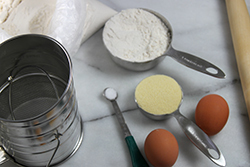 Using a fork, scramble the eggs without breaking the flour "walls." 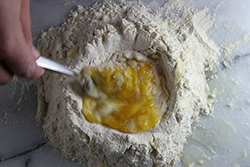 Gradually incorporate flour from the sides of the well until all flour is incorporated and a rough ball is formed. 4. Dust the surface with flour, and knead the dough for 5-7 minutes. Add additional flour periodically to keep the dough from getting too sticky. The dough should be smooth and elastic. 5. Let the ball of pasta dough set covered under a bowl, or plastic wrap for 15 minutes to promote relaxation of the glutens. The dough may be left to rest longer, up to 30 minutes. As it rests, it will become increasingly softer and easier to roll into the required thin sheets. 1. In a large sauté pan, sauté onion until translucent. Add the garlic and saute for an additional 30 seconds and nicely fragrant. Remove from heat and let cool. 2. 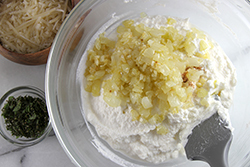 In a large bowl, mix the sautéed onions and garlic with the remaining filling ingredients (parmesan cheese, ricotta cheese, nutmeg, basil, oregano, rosemary, salt, and pepper). Set aside until ready for assembly. 1. 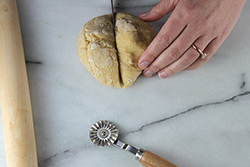 Divide the pasta dough into two portions with a dough cutter or knife. Dust the working surface, and flatten one portion of the dough into a disc. 2. 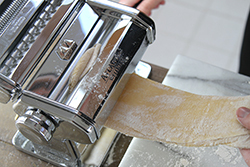 Using a pasta machine or attachment, set the rollers to the widest setting. While cranking, feed the disc of dough into the rollers. Continue cranking evenly until the entire portion has been rolled out. 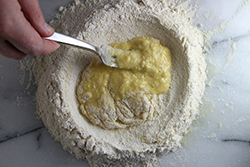 Dust each side of the rolled pasta dough with a small amount of flour. Reduce the width of the rollers to the next thinner setting. Feed the dough through the rollers again. 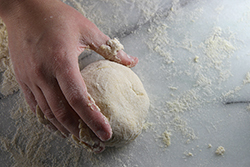 Repeat the narrowing of the rollers and rolling of the dough until the dough is about 1/8” in thickness. Once the dough sheet reaches this paper-thin stage, cut it in half into two sheets. 3. 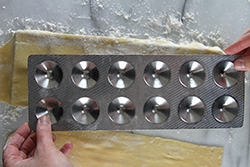 Place one of rolled pieces on top of a ravioli maker ensuring that the dough placement is aligned well. Press the dough lightly into each well of the ravioli maker. 4. 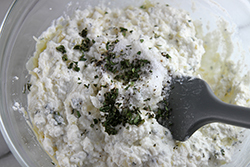 Place a tablespoon-sized scoop of filling into each pocket. 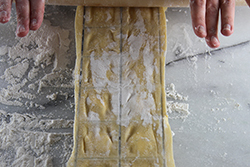 Lightly wet the edges of each ravioli section with a wet fingertip. This will help to seal the ravioli well in the next step. 5. 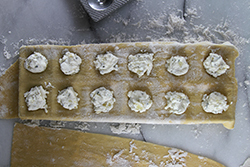 Top the tray with the second sheet of pasta covering the filling. Place the top of the ravioli make on top. 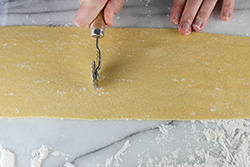 Using a rolling pin, roll over the tray to seal the ravioli. 6. Carefully remove ravioli from tray. With a fluted pastry cutter or ravioli cutter, cut between the pockets of filling forming the individual ravioli. 7. 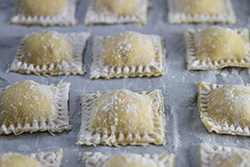 Freeze the ravioli in a single layer on a parchment-covered baking sheet for 30 minutes. This will assist in easier handling during cooking. 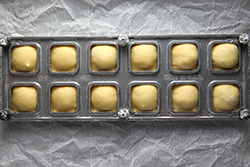 Once frozen, the ravioli may also be packaged in airtight wrapping and stored in the freezer for up to two weeks. 1. Bring 4 quarts of water to a boil in a large pot. Generously salt the water with Kosher salt. 2. 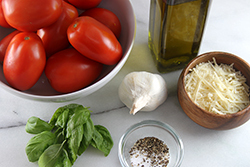 Place the ravioli carefully into the boiling water in batches of 8-12 in order to avoid crowding during cooking. 3. Once the ravioli begin to float, check a corner of a ravioli for doneness. 4. 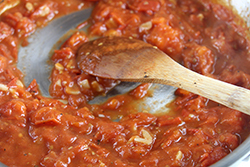 Using a slotted spoon, or a spider tool, remove the boiled ravioli and place in a warm bowl. 1. 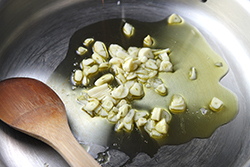 Sauté the garlic in 2 tablespoons of olive oil in a large sauté pan over medium heat for 30 seconds. 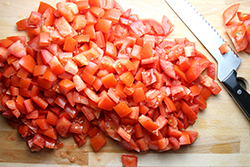 Before the garlic browns, add the cut tomatoes. Simmer the sauce until it reduces and thickens, about 20 minutes. Add salt and pepper to taste. Before serving, stir in 1 tablespoon of butter into the sauce. 2. 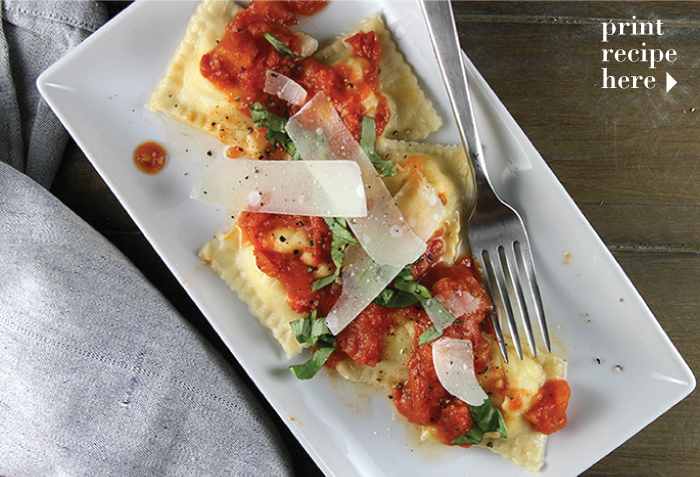 Plate the cooked ravioli, and drizzle the sauce on top. Garnish with fresh basil shreds and shaved parmesan cheese.